Offline Copies for Central BackupPC server | Blog IVITERA a.s.
Our backup server has been based on BackupPC since 2004. Throughout the years we have only upgraded the HW, performed debian stable dist-upgrades, and changed the underlying storage layers. We are still running on the original XFS partition, copied over to new drives and resized many times to satisfy the ever-growing backup requirements. Currently, our backup server (orfeus) runs on inexpensive but so far very reliable HP ML115 (dual core AMD Opteron, 8GB RAM) with total space 4,2TB (1.5TB + 3TB drives) utilized at 60%. Unfortunately, at that time we were running on SW Raid 5 without aligned raid/LVM/filesystem blocks. Creating the LVM snapshot caused the write speed of RAID5 drop down to unacceptable 2-5 MB/s. Later I learned about the seek overhead the snapshot brought (8x ?). This setup required having backuppc shut down while copying by dd the partition to another machine via gigabit link. Unfortunately the copying took long since the whole partition had to be copied over for each offline run. 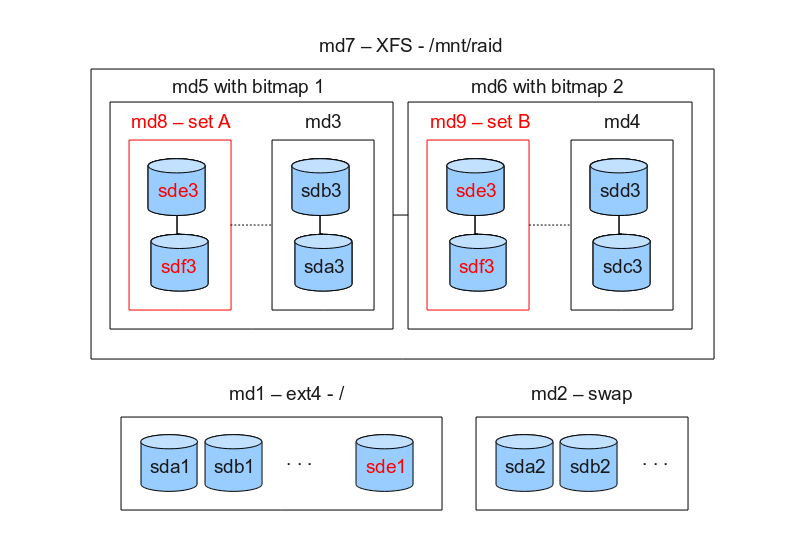 Two pairs of sdX3 partitions constitute two Raid0 stripes md3 (sda3 + sdb3) and md4 (sdc3 + sdd3). The mirrors md5 and md6 constitute the main Raid1 mirror md7, formatted with XFS filesystem, mounted to /mnt/raid. We are weekly rotating two sets of external drives (sde, sdf). They have the same partition layout as their internal counterparts (created by simple sfdisk -d /dev/sdX | sfdisk /dev/sdY). External drives are hooked to the backup server via an additional eSATA controller with hotplug capability. For details see below. Similarly to the internal drives, the data partions of external drives (sde3, sdf3) are components of Raid0 stripe md8 (resp. md9 for the second set). The stripe md8 is the missing part of md5, the other stripe md9 is the missing part of md6. UUID of the md8 stripe fits the md5 mirror, while UUID of md9 corresponds to the md6 mirror. This allows us to take advantage of the automatic raid assembly feature – mdadm -A --scan. Why using two degraded mirrors (md5, md6)? Do you remember the write-intent bitmaps enabled on these arrays? They provide major reduction in the synchronization time by keeping list of dirty blocks since the last synchronization. Since the bitmap supports only one external component, for two external sets (md8, md9) we have to keep two Raid1 mirrors (md5, md6). It is important to make sure the external drives are not added to the arrays automatically upon startup/reboot. In our experience such situation often led to corrupted arrays when the degraded mirrors were assembled with the external drives instead of the up-to-date internal partitions. Commenting out the md8/md9 lines in /etc/mdadm/mdadm.conf and rebuilding initramfs. Blacklisting the module for the eSATA controller ( ahci in our case) and loading the module manually in /etc/rc.local at the end of the boot. Blacklisting in /etc/modules must be accompanied by regenerating initramfs, otherwise the module gets loaded anyway. For details see http://linux.koolsolutions.com/2009/10/11/howto-blacklisting-kernel-module-from-auto-loading-in-debian/. Insert the external SATA drives to eSATA trays, switch their power on (if applicable). Run the backup script start-backup.sh – see below. Since the order of drives (which means their names) can change at any boot, the script must not count on fixed names of internal/external drives. The script automatically detects which present partitions belong to the external drives. It reassembles the external Raid0 (either md8 or md9, based on their UUID). The script automatically adds the newly assembled external array to its degraded “parent” md5 or md6. The script automatically reconfigures BackupPC to prevent starting new backup jobs. The currently running will be left running to finish. This feature minimizes synchronization time and the consequent time the external drives are online and working – see below. Check the script output for errors, there is cat /proc/mdstat put at the end of the script for quick convenient check. Log off and wait for a few hours until an info mail about backup completion arrives from cron. mounts read-only the external filesystem to a test mount point and checks for presence of a test directory. If an error occurs, the script informs about it and exits. Otherwise, it unmounts the external filesystem, stops the external array md8/md9 , and puts the external drives to sleep (hdparm -Y /dev/sd[ef]). The operator is informed about the result by cron-generated email. The external drives are spun down now, the backup server is in standard full operation, and the external drives can be physically removed at any time later. Hook the external drives to any PC. Mount the Raid1 partition of the original root partition to /mnt/root: mount -t ext3 /dev/sdX1 /mnt/root .Here we are taking advantage of the fact that filesystem starts from the begining of the partition, while the mdadm raid superblock is written at the end. While in chroot, start apache, backuppc, do whatever needed. Or umount the backup drives and transfer the partitions by dd to a new backup server. All of the following files reside in a single directory (/root/backup in our case). The script is manually run by our backup operator after external drives are properly attached, recognized by system, and their presence verified in /proc/partitions. echo "Assembling the striped array $EXTERNAL_STRIPING"
# waiting a bit for the array to stabilize, otherwise the subsequent ADD fails with "EXTERNAL_STRIPING not large enough to join the DATA_MIRROR"
echo "Adding the striped array $EXTERNAL_STRIPING to the data mirror $DATA_MIRROR"
echo "Adding the external root partitions to the root mirror $ROOT_MIRROR"
echo "Synchronizing the mirror, i.e. running the backup now, it will take several hours. Thanks." The file contains definitions of key variables and helper functions. It is included (source ...) by the scripts. BACKUPPC_RELOAD_CMD="su backuppc -c '/usr/share/backuppc/bin/BackupPC_serverMesg server reload'"
out "Detecting the external discs"
out "Could not find any partition belonging to any of the external stripings. Exiting"
out "Corresponding data mirror: $DATA_MIRROR"
# Checking whether the external devices contain at least one root mirror. Otherwise exiting. out "External root partitions: $EXTERNAL_ROOT_PARTITIONS"
out "Could not find any root partition on the external discs, exiting." echo "Disabling  backuppc dump runs." echo "Enabling backuppc dump runs"
The script is run by cron every minute. It checks whether conditions for finishing the offline backup are met. Specificaly, if the data mirror (md5/md6) is already synchronized, if no backuppc dump is still running, if there are no other running processes we do not want to interrupt. If the conditions are met, the script calls the finish-backup.sh script. # any backuppc dump task running? # the data mirrors are still degraded, their synchronization is still running. In order for backuppc to not start the nightly cleaning which slows down the synchronization, let's shut complete backuppc down. echo "Shuting down idle backuppc to speed up backup drive synchronization." The script removes all partitions of the external drives from their corresponding arrays while making sure filesystems are preserved. Afterwards, it re-assembles the data filesystem on external drives alone and runs some simple checks. If everything is OK, it puts the external drives to sleep. The operator is informed about finished backup by mail sent from cron. # before removing the external drives, we need flushed filesystem - read-only. Backuppc must be stopped now. echo "Removing the external root partition $PARTITION from the root mirror $ROOT_MIRROR"
echo "Found external drives: $EXTERNAL"
echo "Remounting the data XFS mirror array $XFS_MIRROR read-only to flush the XFS filesystem"
echo "Removing the external data stripes $EXTERNAL_STRIPING from the data mirror array $DATA_MIRROR"
echo "Remounting the XFS mirror array $XFS_MIRROR read-write"
echo "Stopping the external data stripes array $EXTERNAL_STRIPING"
echo "Checking the external backup:"
echo "Mounting the external root fs on $EXTERNAL_ROOT_PARTITION to $TEST_ROOT"
echo "Re-assembling the external stripes array $EXTERNAL_STRIPING"
# we cannot write to the external stripings since that would corrupt their write-intent bitmap. Only read-only mounting allowed! echo "Mounting read-only the external stripes array $EXTERNAL_STRIPING to $TEST_DATA_MOUNTPOINT"
# NOTE - the TEST_EXISTING_DIR must exist in /mnt/raid!" echo "Checking for existence of specific directory - $TEST_EXISTING_DIR"
echo "Checking if $TEST_EXISTING_DIR exists"
echo "All checks passed, correct backup"
echo "Unmounting the external stripes array $EXTERNAL_STRIPING from $TEST_DATA_MOUNTPOINT"
echo "Unmounting the external root fs on $EXTERNAL_ROOT_PARTITION from $TEST_ROOT"
echo "Stopping the external stripes array $EXTERNAL_STRIPING"
echo "Spinning down the external drives"
echo "Now you can safely turn off the eSATA bays and remove the drives." You have put a lot of work into that. Thank you.